A very special Christmas surprise for me this year was opening the newspaper to read this article about my painting process. Thank you to Heather Killen and the Annapolis Spectator! Sumachs in the ‘front yard’. To any painter who feels glum about that cramped studio space at a corner of the dining room table, or in the back bedroom – take heart. 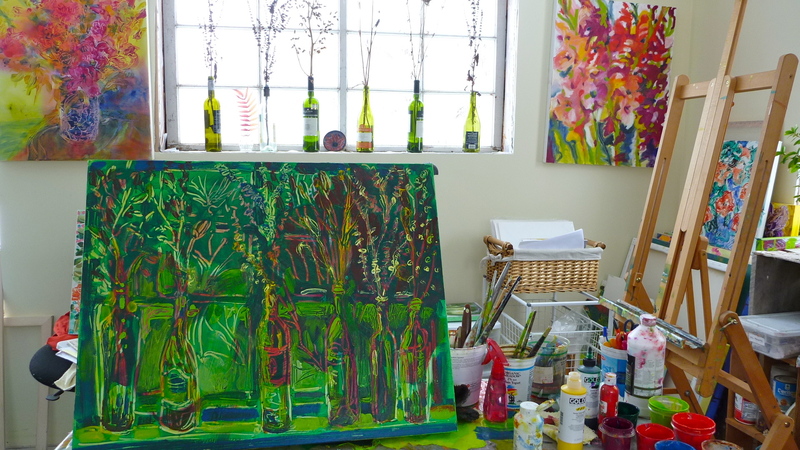 Flora Doehler has a perfectly good studio and most of the time she doesn’t use it. This Bear River-based painter is now living her long-time dream. Her life is filled with art and flowers. Best of all, she has a beautiful art studio that she shares with her life partner and silversmith Larry Knox. 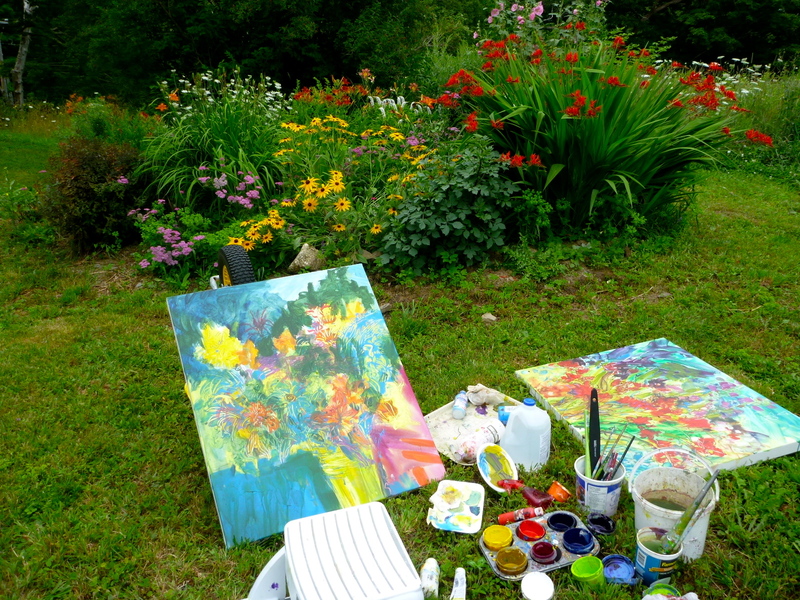 Green Willow Studio is a nice space with lots of good light, yet Flora’s best paintings seem to happen in the yard. Knox said he loves to watch her work because it’s seeing art in motion. Almost like a ballet of brushstrokes. Painting a still life in winter in the studio. Doehler studied fine arts and fine crafts at the Art Centre at Central Technical School in Toronto where she was introduced to painting, printmaking, and weaving. From there she went on to study painting in Berlin and found the German Expressionists. She became mesmerized by printmaking techniques of artists like Kathe Kollwitz and Wassily Kandinsky. Until three years ago she lived mostly in Toronto where she worked as a librarian in the school system. An avid gardener, she dreamed of a time when she and Larry were able to pursue their art and life in the country. These days she can paint whenever she likes with her oils, acrylic, and watercolour using whatever feels right to the time. 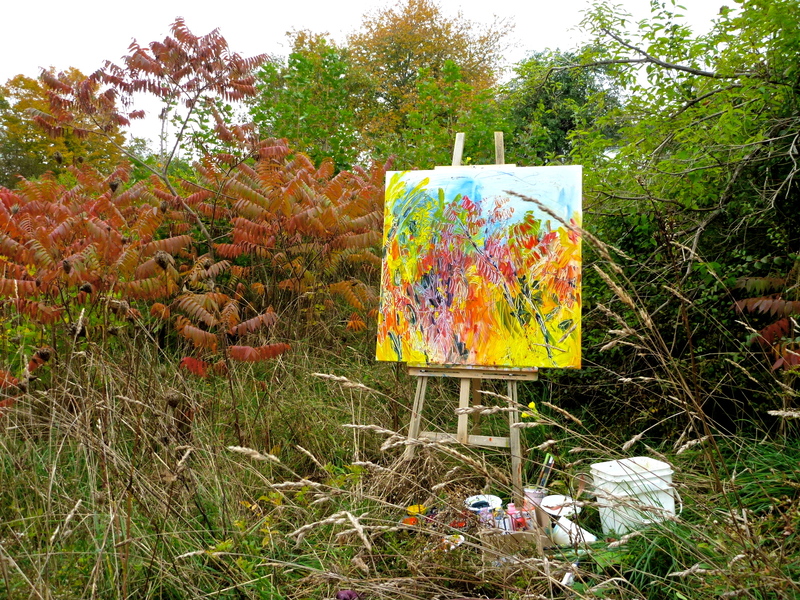 Often she works wet on wet, on a flat surface rather than an easel so the paint won’t run. Layer by layer she builds the form up, using sgraffito technique to scratch beyond the surface into the previous layers. Inspired by one of many flower gardens. She will work from photographs, but says she prefers to paint from life. Completing a painting therefore can become a race against time and the elements. 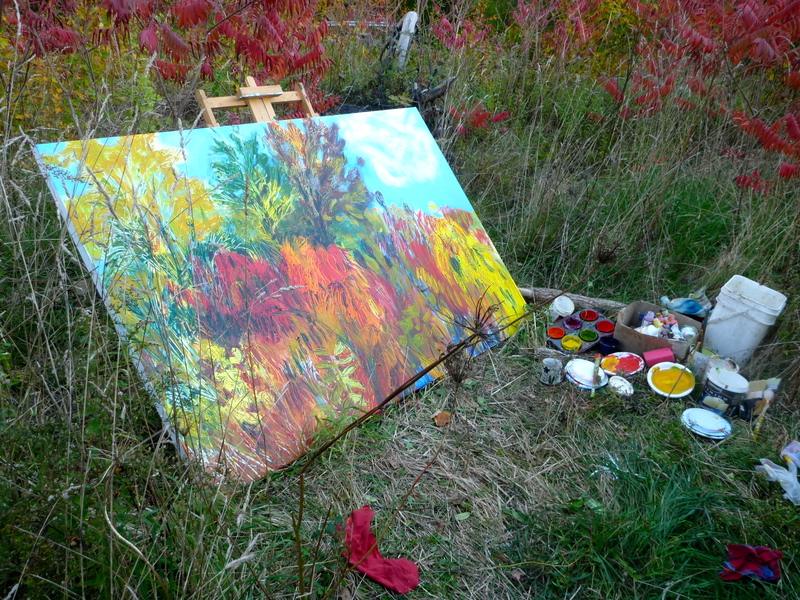 In some cases the paintings take years to complete as she waits until the scene emerges the following season. Green Willow Studio is part of the Bear River Working Artists’ Studio Tour. For more information visit http://greenwillow.ca or see them at 967 Riverview Road, Bear River. (902) 467-0553. A 4′ x 6′ canvas in the sumachs.